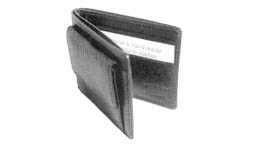 A ladies wallet in polished black. The outer part can be divided into two parts. 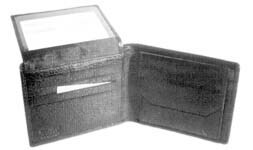 On one side is a zip compartment for coins with a partition. The other side, secured by a Velcro flap, has a single compartment for currency, two side pockets and 6 slots for credit cards. This billfold has a unique design on the front and a pocket at the back. The open RHS has a coin pocket. 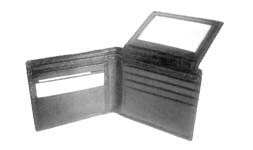 The open LHS has a flap with 3 credit card slots and a transparent windown for the driving license. Beneath the flap, there are 4 more credit card slots. Two note compartments and a side pocket complete it. A ladies frame purse that also has the qualities of a wallet. The frame area is in the middle and both sides have press button enclosures. On opening, one side has 2 credit card slots & 2 deep side pockets. The LHS of this portion has a driving license window. The opposite side has 2 note compartments, a deep side pocket of size 16 x 11 cm, 2 credit card slots, a side pocket and a window. It can also be made from Buff leather. 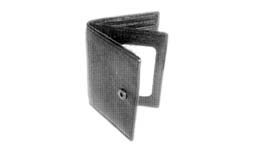 This is a leather tri-fold wallet. It has one note compartment, two window compartments, 12 credit card slots and 4 side pockets of size 10 x 6.5 cm. A small billfold that slides easily into your pocket. Notice the coin pocket in the front. 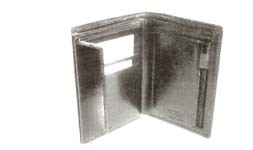 On opening, there is a single note compartment with two side compartments and three credit card slots on each side. A leather wallet with plenty of room for credit cards. It has 2 note compartments, 2 side pockets and a zip pockets for coins on the RHS. The LHS has a flap closed by a press button. On releasing the button you are exposed to 5 credit card slots and a plastic window for keeping your driving license. On closing the flap you have 4 more credit card slots on top. 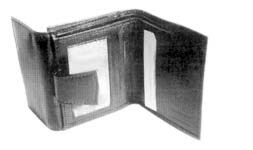 It is a leather tri-fold wallet. 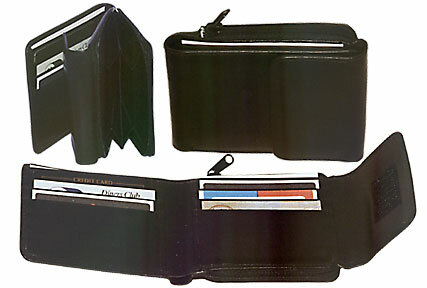 It has one note compartment, two window compartments, 12 credit card slots and 4 side pockets of size 10 X 6.5cm.